Types of data backup are integral for choosing the right backup strategy. After you have determined what to back up and what backup storage media fits the best, you need to decide how the files will be processed. The main things to think about here are the method of backup and compression options. Mixed backup – a sequence of full backup and some incremental or differential backups, rotating repeatedly. The full backup is a basis for any differential backup or incremental backups, as well as for mixed backup. Let us demonstrate some examples of different backup methods. Full backup assumes that each time you execute the task, the entire set of data is copied to the chosen place. Full backup takes much space, time and PC resources, and often makes many redundant data copies, as most data in the dataset bear no changes between backups. Note: For some types of data, e.g. when you create a complete disk image backup, full backup is the only effective option. Incremental backup processes only files that appeared or changed since the previous incremental backup. It can also provide a good substrate for backup with timestamps, when the software solution places new incremental backups into different, time-marked folders. Example: If you created a task for backing up My Documents folder and do an incremental backup immediately after a full backup, then the task will copy no file. However, if you modify some files and then run an incremental backup, the task will copy only these files in your dataset. Differential backup is very much like incremental backup, although it uses a last full copy of a dataset instead of a last incremental (or differential) backup file. This approach requires more disk space for backups than incremental backup, but provides faster restoration. Note (geek talk): technically, Handy Backup managed differential backup with the use of XDelta open-source utility. At a certain moment of software evolution, there also appeared rsync working for optimization of data transfer. The basic edition to bring you all common types of backup (full, incremental, differentail and mixed) is Standard. Try Handy Backup just now to get your data protected! This approach is a combination of the two different types of backup: full and incremental or differential backups. It also resembles a versioned backup technique. By this method, a full backup takes place, followed by some fixed quantity of differential or incremental backups. After this cycle completes, a new cycle starts. Note: The mixed type of backup can work especially effective to the databases and dynamic website content, where the stability and regularity are the most important attributes of good data saving. Since data backups are not meant to be used as separate documents, it seems reasonable to enable automatic compression, in order to save storage space and transferring time (may be important if you back up online, or back up to FTP locations). Note: You may compress your files as a whole, or zip each file separately. The first method often saves more space, as the second is less time-consuming and significantly faster. After choosing a backup type, it is important to choose how often the task will be performed, and specify a backup schedule. 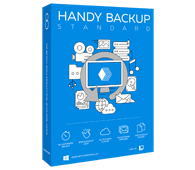 Handy Backup supports and manages all types of data backup described in this article, as well as many other great features and options, providing a total automation of your backup strategy for any data existed!